So I got my 5lb. 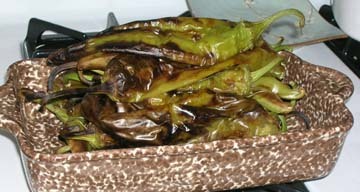 shipment this week – the first of the (2 weeks early) harvest from Hatch, New Mexico. It made for a busy afternoon / evening: washing and then roasting all 5 pounds in our little broiler. On the one hand it’s hard work, on the other, it’s pure entertainment (the chile-roasting smell alone is intoxicating). I ordered the “medium” and the first taste was disappointing – too subtle in its flavor but further tasting provided some wonderful zest and more robust flavor. Overall, I can’t be critical. I’ve been eating it all day (breakfast, lunch, dinner and in between too). John asked me (with a smirk), “…do you want me to hide it?” I’m beginning to think there’s nicotine in it. Then again, I come from the land of “red or green?” – the only place where chile is not an option is Baskin Robbins. 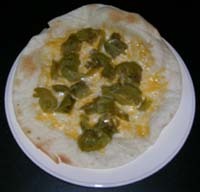 New Mexico’s McDonald’s has green chile, so do all the pizza joints. They couldn’t compete without it. As for the report: I’ve been advised to wait a couple weeks for a better pick of the harvest. Great! – I hope those nicotine patches work in the meanwhile.